I wish anime had that ability to inspire me but it doesn’t. Perhaps I am far too old for the genre. I can enjoy a good plot, fall for e beloved character, feel sadness at a loss but the conflicts they undergo don’t reach me at the level of inspiration. Maybe you just haven’t found the right anime? Do stories in other mediums inspire you? I feel any good anime gives me a boost when I’m feeling a bit down, but the one that sticks in my mind the most is Shirobako. I’d dreamed of a job in animation for a long time and, at the time, I was stuck in a dead job that just made me feel like I was going nowhere. Watching Aoi and the others struggle with the realities of the industry resonated with me and gave me hope. I don’t think I’m ever going to get a job in animation, but that’s let me channel my energies into my writing, which I love equally as much and there’s always the small hope that one day something I write will be animated. It is always great when an anime gives you that feeling of hope or just something to look toward. I love watching Snow White with the Red Hair and the original Cardcaptors when Im feeling sick or demotivated. I just watched them again recently too while I was similarly feeling sluggish and worn out. Original Cardcaptors definitely gives a bit of a lift. Sakura is pretty resilient and good at getting back up again when things don’t go so well. I think its also nostalgia for me. Nostalgia is good at providing a sense of comfort. Hope you are feeling better and manage to recover from your recent illness Karandi! I’m biased, so I’m going to raise Holo and Lawrence and put them on the pedestal, watching not one but two characters jointly succeeding from lessons and opportunities, and also supporting each other for that reason. Nice choice of characters and thank you. Welcome. I am glad you managed to find your own strength. Deku and co. have been really consistent in motivating me every time BnHA rolls around, and I remember Prince of Stride Alternative did the same to a smaller extent while it was happening. I think a lot of underdog stories tend to motivate people, regardless of their medium, so Megalobox (which I’m currently not caught up with) might end up being the same way. Prince of Stride was kind of motivating. It was fairly forgettable afterwards, but while watching it certainly gives you a bit of get up and go. Most inspiring anime is, of course, Monogatari Series. And I’m lying if I said I didn’t feel more attached to this cast of characters more than any other show or movie I have ever watched. IT is great seeing some characters grow and develop. Thanks for sharing. Oh wow, sooo many and of course for some reason I’m blanking now. I guess Sachiko from Erased and Tsukushi from Days – specifically in his relationship with his mom…. I know. When asked which anime or which character inspired you there’s like this amazing blur of images in your head and then you can’t distinguish a single one. Later of course you realise the massive number that have but at the time its like a brain freeze. Wonderful post, Karandi! I’ve never put a lot of thought into how anime has picked me up when I’m in a rough spot, or how it’s inspired me, but reading this I totally agree that it can and does. A few I’ve noticed that help pick me up, and they might be odd, are Angel Beats (because it put the whole “I need to move on and find happiness somehow and let go of certain things” in my head even though it’s sad), White Album 2 (because dedication to achieving a goal you’ve set–like playing in a band–can make all the difference), and Toradora (for the laughs and the emotion and everything it is). Nice choices. I tend to watch Angel Beats when I need to cry. It gives me an excuse to let out bottled emotions. I usually feel better afterward, but I almost always follow a watch of Angel Beats with something very light hearted. Now, he and his friend Aoyagi tackle a lot of problems together, but I feel like I relate to Teshima on so many levels, and his character is truly inspiring to me. 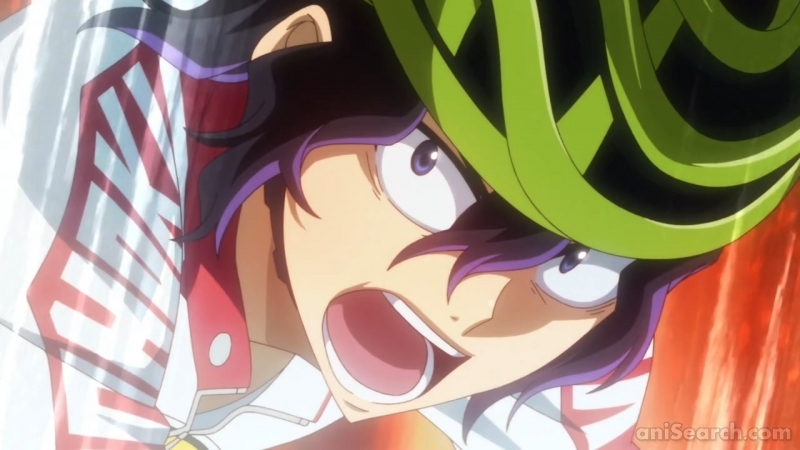 This is a dude that is clearly outclassed by the other major characters around him, but through planning and intense dedication/work ethic, he levels the playing field and manages to be the captain of the Sohoku cycling team. I legit have a Teshima/Aoyagi wristband. Also Mumen Rider from OPM. That dude’s a real G.
It’s nice when a character does more than try harder but also plan an approach to overcome an issue. It’s a weird choice but early Griffith. He built himself up from nothing and had all the traits of a great leader, then used politics to get closer to the throne. It was inspirational until, you know. Yeah obviously the early Griffith. There is a lot of inspirational things about him then. Wow Karandi, I was seriously having this discussion with Mel the other day. My hiatus in blogging has been stems from work and stuff, and partly feeling insecurities on top of whatever. I’ve been heavily invested in a particular anime, manga, and fanfics, and honestly the discussion I had with Mel was basically how much Deku in Hero Academia speaks to me on so many levels, and how much of an inspiration he is. If hero academia had come out when i was younger, I wonder if I could’ve felt better about myself and dealt with things the way Deku does. I seriously need to write a post about Deku and Hero Academia at some point this year. Great post – sorry I wrote an essay as a reply. Thanks for the thoughtful reply. Midoriya is really inspiring and hopefully you will get a chance to write about him at some point. I’d love to read it. Kuroko and Deku are two inspiring character that show me to never give up our goal. Even if you fall you can always get up and try again until you succeed.